Story: Stone began his adventures as a member of the Allies during WWII. As a young G.I. he distinguished himself thrught his valor and bravery in combat, and was recruted for the Allies [2, 4]. On a mission Super-Patriot was wounded, and Die-Hard blamed Stone. Being the commanding officer Die-Hard dismissed Stone from the Allies . Not much has been revealed about the years after WWII. He did a tour of duty in both Korea and Vietnam . In 1986 Stone was recruited for CIA's elite death squad Operation: Knightstrike. His first assignmen was to recruit Al Simmons, Chapel, Duke, Dutch and Peter Frehley . During his last mission, he was assassinated by Dutch who worked for Giger and his organization Cybernet . 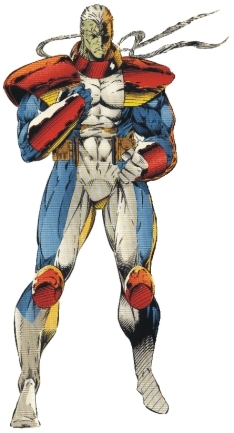 Stone was reanimated thru Project: Born Again, and went on to lead the first Youngblood team, but not for long. On a mission in the Persian Gulf in the summer of 1988, he accidentally killed one of his subordinates and was dismissed from the team . After the dismissal from Youngblood, Stone started his mercenary activities and shortly thereafter started Brigade . Hacker, a member of Brigade, was kidnapped by Denis Kraven  and forced to betray Brigade. Somehow Kraven also got to Boone, forcing him to betray Brigade too, ending in Boone stealing the data on the members of Brigade gathered by Thermal and Hacker helping him get away. The mission ended an explosion which killed Battlestone, and Kraven took the body with him [4,5]. Battlestone was reanimated again, making him stronger than before . This time he was assigned to Youngblood as leader . The leadership went quite well compared to his earlier leaderships, but as time passed he discovered that upon his last ressurrection Lord Dredd had tampered with his mind . Skills & abilities: Battlestone possesses superhuman strenght and endurance and is an expert in hand-to-hand combat and weapons.